Mount any smartphone onto your vehicle's dashboard with the Universal Stick-On Adhesive Magnet Dash Mount from WizGear. 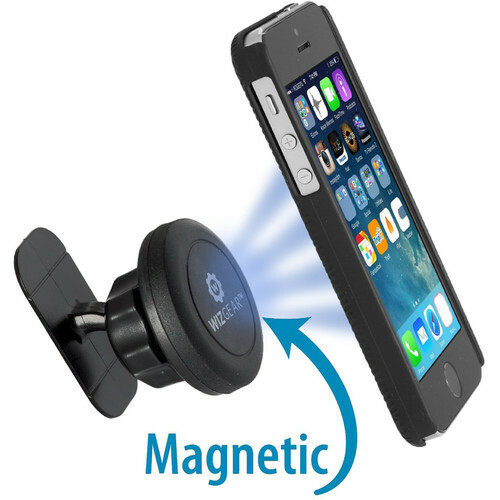 This mount features a reinforced magnet that's designed to securely hold your device and keep it from falling. Once secured, you can swivel, rotate, or tilt your smartphone to the viewing angle that best suits your needs. Installation of the mount is fast and easy. Simply place the included metal plate inside your phone case, and attach your phone to the mount. The magnet holds your phone securely in place, enabling you to use it for navigation, hands-free calling, and more. The reinforced magnetic holder of this mount is designed to hold any smartphone, including Android, Apple, Blackberry, and Microsoft devices. The base of the mount securely holds the magnetic head to keep your smartphone in place, regardless of road vibrations or impacts. Rotate your smartphone and swivel your display as you please. The base of the mount remains fixed into the air vent of your car and does not move, no matter how much swiveling or rotating you do, ensuring your smartphone remains in a preferred position. Box Dimensions (LxWxH) 5.3 x 3.25 x 1.55"
Universal Stick-On Adhesive Magnet Dash Mount for Smartphones is rated 4.2 out of 5 by 21. Rated 3 out of 5 by Carlos from Magnets for days Pro: Sleek design and solution Easy to install Adjustable Cost Cons: Ball join sometimes can't hold weight of iPhone 6s Plus and swivels down. Metal plates didn't stick to back of my case, had to used super glue. * *magnetic force is not strong enough with one plate inside between iPhone and apple silicon case, phone falls off. Had to install one inside and stick one outside. Magnetic gripe doesn't prevent my phone from twisting out of alignment when driving. I drive a semi. Rated 5 out of 5 by truffler from Great product. It works very well. I installed this in my sons car so that when he uses his phone GPS he would not have to hold the phone in his hand. It has actually made his driving safer. I was skeptical that it would hold the phone on the bumpy roads around Houston but it does! I liked it so much that I bought 3 more, one for each car. Rated 5 out of 5 by silly f designs from Excellent product and service!! I bought one for myself, and then purchased another for my best friend. Great service, too!! Rated 5 out of 5 by Andrew from Compact and useful. Just the right thing for an unobtrusive center dash mount. Rated 4 out of 5 by Anonymous from Very good product. Works great! Very simple to setup in my car. Rated 5 out of 5 by Anonymous from Perfect for what I needed The adhesive is VERY strong. Rated 5 out of 5 by Anonymous from I would buy another for sure . It's great. Strong hold . It comes with 3 pieces of metal for the magnet to hold. You can put it in between your phone and case. If you don't have a case you can also put it inside your phone where the batter is located . If you cannot open you will have to adhere to the back of the phone . That would be the only downfall. The magnet itself comes with adhesive and 2 spares. It adheres we'll. Overall happy with purchase, especially for the price. Rated 4 out of 5 by Anonymous from Adhesive loosens in summer heat The product is great. Well designed and pretty unobtrusive.Holds my iPhone very securely but I noted that after sitting outside for several hours in the hot Georgia sun, the adhesive gets gooey and tends to pull away from dash when removing phone. Am going to put up sun shade but I guess I just have to be careful on those hot summer days. What does the magnet do to the memory of the phone? Nothing. Magnets like this do not affect the data on or operation of the phone. Once you mount it, if you want to relocate it, can you take it off to reposition and then re-mount it? Agree with Kim B. There are extra adhesive pads for that purpose. I haven't tried to move mine. Ad says it is adhesive stick on and shows a picture attached to dash and detail in overview says it attaches to air vent. Which is it? How many plates come with it? Is adhesive base flexible enough to mount on curved surfaces?